Ted Cruz and the Obamacare shutdown: Is he the Senate’s most shameless hypocrite? 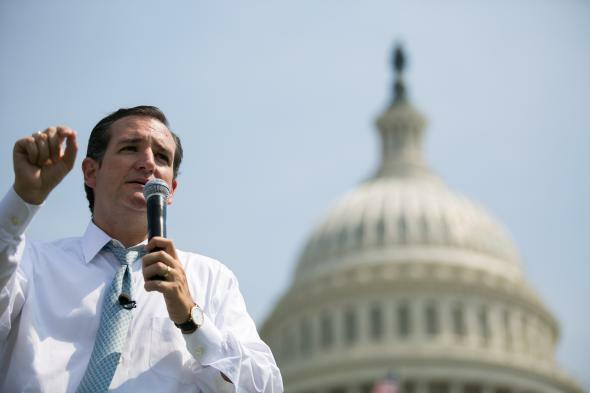 Obamacare, partisanship, and the shameless hypocrisy of Ted Cruz. Sen. Ted Cruz speaks during the “Exempt America from Obamacare” rally on Capitol Hill, Sept. 10. On Friday, the U.S. House of Representatives voted 230 to 189 to fund the government for the rest of the year only if the Affordable Care Act, a.k.a. Obamacare, doesn’t get a cent. Essentially, the resolution tells the Senate and President Obama: Accept our demand to gut Obamacare, or the government shuts down. For those of you doing the math at home, 230 ayes on the roll call means that 53 percent of House members voted for the ultimatum. Republicans pushed it through on a party-line vote. As Slate’s David Weigel points out, Democrats voted against it, 188 to 2. That was Friday. On Sunday, Cruz reappeared on Fox with a different message. In the Senate, he told Chris Wallace, “The first order of business is going to be to ask Harry Reid if he will agree to allow amendments to be subject to a 60-vote threshold. And that’s typical in the Senate.” By requiring 60 votes, the GOP could prevent the Senate’s Democratic majority from amending the resolution to fund the entire government, including Obamacare. Cruz lamented that Reid would probably reject this procedural ploy, “because he wants to use brute political power to force Obamacare funding through with just Democrats.” In that case, Cruz concluded, “the majority leader is abusing his power,” and Republicans should filibuster the resolution. So this is Cruz’s position: When Republicans ram an ultimatum through the House on a 53-percent party-line roll call, using the threat of a shutdown to gut a bill they lack the votes to repeal, that’s unity and courage. When Democrats threaten to use their 54-percent majority in the Senate to restore Obamacare to the resolution—which could then be voted up or down, or filibustered by the GOP—that’s abuse of power. Every politician fibs now and then. Some do it better, more often, or more passionately than others. Even among the elite of his profession, Cruz stands out for the sincerity and deep feeling with which he can tell you one thing on Friday and the exact opposite on Sunday. He’s a national treasure. I can’t wait to see what he’ll say next.